Earlier this morning, we told you that LG had officially unveiled the LG Q6. Three variants of the device were introduced with the difference between them being screen resolution, the amount of RAM, native storage, and the color options. Pricing, when officially released, will also vary among the different versions. The LG Q6+, LG Q6 and LG Q6a each feature the FullVision display with an 18:9 aspect ratio and slim bezels. 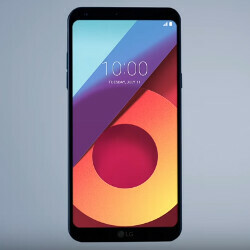 LG released a pair of videos this morning with one showing the LG Q6 in various poses using different video effects. The screen on each model features a 5.5-inch display with a 1080 x 2160 resolution (FHD+). As we mentioned earlier this morning, LG has placed face recognition technology inside the new handsets, which are made using series 7000 aerospace aluminum. If smartphones ever headlined a show in Las Vegas, it would look something like the first video to be found in the video slideshow at the bottom of this story. The second video uses a pair of glasses to show how the FullVision display offers a more inclusive view, with eye-popping colors. I'd have thought of buying it only if, LG used S660 soc and stock android.